What’s that you’re reaching for, Lester? A little glove goo for that slider? Or nothing? Probably nothing. 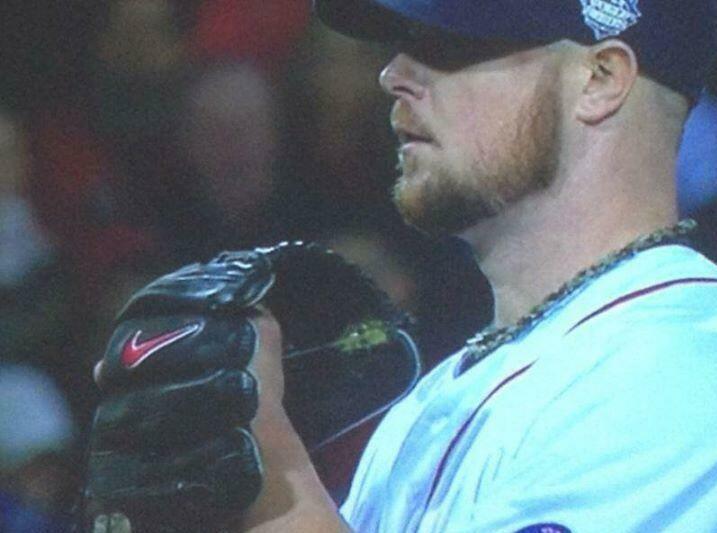 Lester pitched a helluva game to put the Sox up 1-0 on the Cards. I’m guessing this is nothing, but what the hell do I know? I saw the Vine from @MattSebek, and the screengrab from @bustedcoverage. That would be some-kinda-ballsy move from your ace to show up on the biggest stage in the game with friggin’ Crisco on his mitt. Just don’t see Lester pulling an Eddie Harris in the World Series. Am I just too naïve? This entry was posted in Baseball and tagged Cardinals, is jon lester a cheater?, jon lester, jon lesters glove, major league crisco eddie harris, Red Sox, what's on jon lester's glove, World Series. Bookmark the permalink.